The Herpatofauna of Alberta Biobank (HABB) is an initiative that coordinates the collection, curation and supply of amphibian and reptile tissue for genetic, disease and contaminant research, and other applications. The Herpatofauna of Alberta BioBank is a collaborative project developed by the Alberta Amphibian and Reptile Specialist Group (AARSG) and the Royal Alberta Museum (RAM). Under the HABB initiative, tissues will be collected and preserved following standardized protocols and shipped to RAM in Edmonton for curation, storage and disbursement. Donated tissue will be managed by RAM and disbursement of tissue will be at RAM’s discretion. RAM will verify identity of material submitted to the HABB. Road kill surveys. In trips to the den in the fall the numbers of snakes found dead on the road after vehicle collision was astounding and troubling. Each visit fifteen or more snakes would be found on the township road which borders the property. Granted not all of these would be from the Lake Eden den. However, the road is likely a significant strain on snake populations throughout the Lac Ste. Anne and Sturgeon counties. The remaining dirt portion of this road is due to be paved and we would like to assess this threat before that happens. Under-road wildlife tunnels may be a solution worth looking into and have been used successfully in Waterton Lakes National Park. Monitoring. AARC would like to continue PIT tagging and monitoring the snake population and build a database that can be used to monitor the population without the intensity of a full census each year. If tagged snakes are found away from the den, it is important information regarding habitat usage for the summer. Spring and fall field trips may be in order to survey the property for additional den sites, to learn more about what may be a large, dynamic population. In 1998 the Lake Eden Garter Snake Den had approximately 8500 snakes and was the center of a relocation project. An additional 1190 snakes were brought over from another site threatened by development. Snake hibernacula rarely exceed 5000 animals and may contain multiple species of snake (Takats, L. 2002). This hibernaculum consists of a single species, the red-sided garter snake, Thamnophis sirtalis parietalis and may be the largest den site West of the world renowned dens at Narcisse, Manitoba. There has been an increase in foot traffic as many people visit the den each spring to view the spectacle of garter snakes leaving hibernation and mating en masse. Due to observed heavy foot traffic and convincing anecdotal evidence that the local population was declining it became imperative to perform another population census. Since its inception in 2013, the den site has been a major focal point of the Alberta Amphibian and Reptile Conservancy (AARC). The size of the snake population, the growing need for conservation, and the sheer educational value of this area for central Alberta make it important to protect. Assessing the population was the first step to affirm that there was a need for additional protective measures. In preparation for the population census AARC prepared an estimated budget for the project. Costs included materials, such as rebar and poly to build a drift fence that would surround the den site, snake trap construction materials, a microchip scanner and other tagging equipment. A portion of the budget was also set aside to cover gas costs for volunteers traveling to the site for daily snake counts (round trip was approximately 110km). Delays in gathering materials, permits from Fish and Wildlife and a quick change from snow cover to summer-like weather almost postponed the census another season, but everything came together and the project was able to go ahead. With the drift fence up the snakes were observed, but not counted immediately. It was important to not disturb this essential time of spring emergence and breeding. Each morning during this time a wave of snakes would leave the den to bask wherever it was sunny. Then they would return to the den or males would follow females in gatherings known as mating balls. Almost immediately after the sun set the snakes would disappear into the den or under cover for the night. After mating activity decreased and snakes trying to leave were gathering, collection traps were placed at various locations inside the fence. At least once daily, the snake traps were checked for occupants, the animals were counted as they were carried over the fence, and released. At this time some animals were measured and PIT tagged. Passive integrated transponders, or PIT tags, are inert glass covered microchips that are inserted under the skin. A hand held reader scans the tag and presents its unique 14 digit number. Such identification is useful for future monitoring of both the individual animals and the population as a whole. Between May 17th and June 9th two thousand four hundred and fifty three snakes were counted. These findings were fantastic to see as we were worried the population had dropped to a mere few hundred snakes. We were optimistically hoping to find one thousand. What this number tells us is that there certainly is still a large and viable population of snakes worth protecting, and it also tells us that our concerns over drastic declines were certainly merited. The population at the den has reduced by 75% in 15 years! Loss due to road kill. The Lake Eden Den is near a road, which is frequented by local traffic, gravel trucks, and ATVs, and troubling numbers of dead on road snakes have been observed in the area. Loss due to natural dispersal of snakes. The original snake count was immediately following the translocation of a large number of snakes from another den site. It is possible that this over-inflated the Lake Eden den population, and the observed decline is a correction for this. 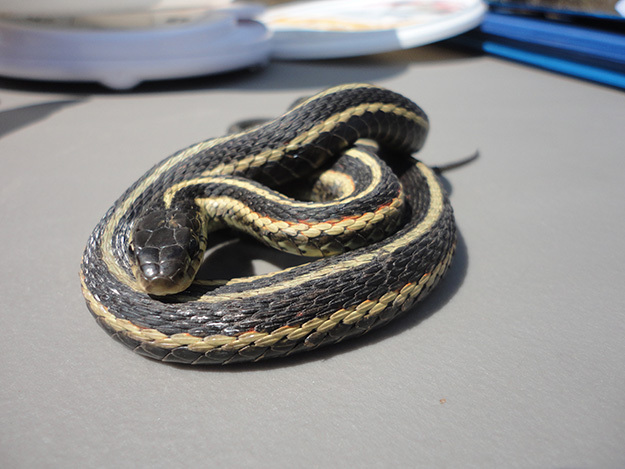 ATCO has a proposed power line project that cuts right through our garter snake habitat. The construction of this project could very well decimate our already declining population. AARC is doing its best to have the power line built in another proposed location. The landowner wants to sell the land where the garter snake den is located. AARC is trying to work with other organizations to arrange a purchase and/or creation of preservation area. A major fundraising effort may be just around the corner! The Alberta Amphibian and Reptile Conservancy would like to sincerely thank everyone that donated in person or to our online fundraising campaign. Without these contributions this project would not have been possible and we would be no closer to our goal of protecting this special snake population. We would also like to give extra thanks to the Edmonton Reptile and Amphibian Society (ERAS) who generously donated significant funds for us to meet our goals. Also thank you to Kris Kendell of the Alberta Conservation Association for donating the very same snake traps used to count these snakes in 1999. Norm and Violet Holyk of Flash Drywall donated poly for the drift fence and EIDAP gave us a significant discount on our microchip reader. Kyle Welsh, Diane Haughland, her friend Paul, Leah Stables and her friend Jordan also deserve thanks for coming out to assist with snake counting and processing.